We are delighted you will be joining us for a special strings workshop. What to bring: Your instrument, a music stand, and your music. Parking: Parking is difficult in this residential neighborhood. We highly recommend public transit: the 1-California and the 24-Divisadero lines both stop just a block away at California and Divisadero. If you must drive, please allow plenty of time to find parking. Whether the notorious (and glorious!) Mendelssohn Octet is an old friend, a new acquaintance or a total stranger to you, welcome! NEQ will offer some historically-informed perspective on one of the most exuberant and well-loved works in all of chamber music, along with practical suggestions for solving some of the problems typically encountered. Modern performance tradition for the Octet can sometimes become a liability, resulting in an unleavened and monochromatic reading. A fresh look at articulation, balance, bowings and phrase direction can breathe new life into your approach to this irresistible work of young genius. Please download and print your part and bring it with you to the workshop. Break-out coaching sessions will focus on the first two movements, and the workshop will culminate with a reading of the entire work. PLEASE NOTE: in this workshop, all will be playing at standard concert pitch (440). New Esterházy Quartet has been performing the works of Haydn and his contemporaries on historical instruments since 2007, with occasional excursions into 20th and 17th century repertoire. Members Kati Kyme, Anthony Martin, William Skeen and Lisa Weiss are leading players on the international early music stage. The ensemble has recorded four Haydn CDs, a work by Hungarian composer Imre Székeley, and their latest release, a recording of Schubert’s monumental G major quartet. 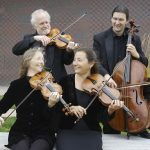 NEQ produces an annual subscription series in San Francisco, Berkeley and Palo Alto, and teaches a popular classical chamber music workshop every summer. For more information, please visit their website: www.newesterhazy.org. KATI KYME has enjoyed decades of chamber music with The New Esterhazy Quartet, The Artaria Quartet, The Yale New Music Quartet and the Berkeley String Quartet. She has participated and taught at the Humboldt Chamber Music Workshop from ages 14-19, performed quartets at Yale at Norfolk, the San Luis Obispo Mozart Festival, the Santa Fe, NM Chamber Music Festival, the Seattle Early Music Guild, the Teton Music Festival, the Spoleto Festival and many more. She finds the greatest happiness in making music with a coterie of friends. LISA WEISS has been playing quartets since middle school and was the first person in North America to earn an MM in chamber music. In addition to NEQ, she currently performs with Cantata Collective and as a concertmaster with Philharmonia Baroque. She is an avid amateur naturalist and also enjoys gardening, hiking, and creative projects. ANTHONY MARTIN has performed the Mendelssohn 8tet half a dozen times, playing 3 of the 4 violin parts and one of the viola parts. The most memorable was the first time, in Boston many years ago, as lead violin in an ensemble with 7 women who could not seem to get along or agree on anything. He has hopes that in spite of the heavily caffeinated nature of Mendelssohn's music this workshop will be congenial and harmonious! WILLIAM SKEEN performs as Principal Cellist with Philharmonia Baroque Orchestra and American Bach Soloists. He has served as Principal Cellist with Musica Angelica (Los Angeles), Portland Baroque Orchestra, Pacific MusicWorks, and Bach Collegium San Diego. William has also appeared as continuo cellist with the Los Angeles Philharmonic, San Diego Opera, and the Los Angeles Master Chorale. In addition, William has soloed on the viola da gamba with the Dallas Symphony, Los Angeles Master Chorale, Carmel Bach Festival, Oregon Bach Festival, Musica Angelica, Orquestra Nacional de Mexico, and the American Bach Soloists. He has served on the faculty of University of Southern California Thornton School of Music since 2000. Mr. Skeen is co-founder of the Cantata Collective, and one-to-a-part ensemble devoted to presenting all of J.S. Bach's cantatas to the East Bay community free of charge.